Bringing Back the Charm of the Past! Have you ever grown frustrated with the entitlement attitude of our society? Do you have any fond memories of how our society used to be back in the day? Do you believe that our culture has forgotten principals of timeless wisdom of old in how we live today? Do you desire learn from the past? 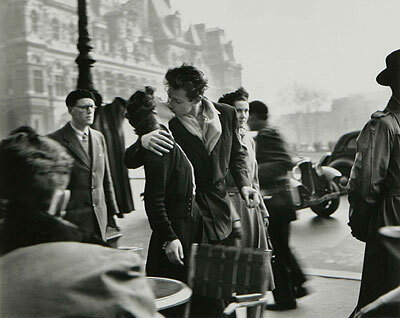 I love this photo done by the famous, French photographer, the late Robert Doisneau. I actually have an enlarged print in my home and cherish the value and essence of what is captured within. Though, I can’t credit the image for what drove me to write this article. I believe it does however capture the essence. What drove me was more a progressive thought that built in my mind and culminated as I reflected on the recent devastation in the world such as the earthquake in Haiti and the beauty of the Colorado Rockies during a ski trip I was on. I watched so many privileged families and individuals whom I was among that were enjoying a magical travel and leisure opportunity. I was saddened by the thought that there was a definite sense of reality check that was being missed in the world around us and even more so the problems within our own self-absorbed, self-centered, culture that seem to permeate throughout and a greatly blinded or selfish nation. – Why has our society thrown away the charm of our past? I truly pray that something in this article resonates with your spirit. I pray it does more than that. I pray it spurs you on to make changes and take action within your own life. We can all become change agents and reclaim the beauty and charm of the past by starting within our own lives. Great thoughts and passion without action, creates no change. Will you join me in becoming a change agent for God’s glory and the blessing of our world? Posted in Marriage, Love & Family, Spiritual Insights and tagged charm, family, Family values, Spiritual / Devotional, spiritual life, Spiritual Life Growth, the past on February 6, 2010 by joesharp.